For centuries, the island of Murano, off the coast of Venice, has been a center for glass making. At work a few weeks ago, I was lucky enough to meet Carol Scalzo, the owner of Benedetto Imports, which imports Murano Glass. Benedetto Imports sells all types of Murano glass objects - vases, jewelry, mirrors, and more. The chandelier pictured is in production and will be installed in the Revival Flooring & Stoneworks showroom in Hingham, MA. Carol says she takes no credit in creating these wonderful pieces of art, but "putting them together is an art within itself." I don't doubt it! I'm typically into more modern design than Murano glass, but between the world-renowned level of craftsmanship in the glass works and Carol's expertise in the importation and installation, I have to give my recommendation. I read somewhere that Venetian Glass can sometimes be deliberately tissue-thin! Makes me wonder what innovations in packaging the importers had to come up to ensure the saleability of such delicate glass. You're right. Any hand-blown glass is thinner than machine blown, and has a higher likelihood of little bubbles showing up in the glass, making it even more brittle. I would love to know about the packaging technology the importers use for Murano and Venetian glass. The chandelier has arrived. I am pleased to find..... not one piece was broken. 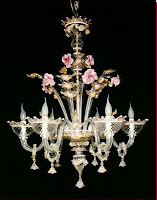 And you can see that this particular chandelier has very delicate flowers on many areas. Each piece came tightly wrapped in at least 2 pieces of heavy paper then wrapped and folded in bubble wrap. The way they placed the parts in the box resembles a perfect puzzle. As I put them back in the box, I cannot close the box! I am very excited to have this chandelier debut in just a few short weeks. We look forward to your visit to the Revival showroom. IMPORTANT NOTE: This Chandelier is actually hung at the Mid Mod Design Gallery in the Boston Design Center as of January 24, 2008.